March 5 was a good day for elephants. Not the elephants roaming free in their natural habitat -- for those elephants every day is a good day. I am referring to 43 Asian elephants that Ringling Brothers and Barnum & Bailey circus keeps in chains. These cruel acts will be a thing of the past starting in 2018. March 5 was a good day for elephants. Not the elephants roaming free in their natural habitat -- for those elephants every day is a good day. I am referring to 43 Asian elephants that Ringling Brothers and Barnum & Bailey circus keeps in chains and tortures with bullhooks (long poles with sharp hooks on the end) in order for them to do tricks in the circus for us humans and our kiddies. 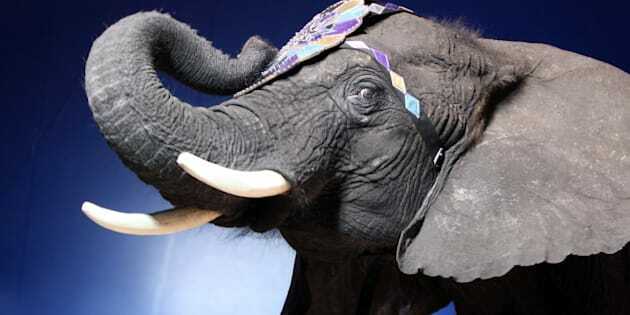 Families have attended Ringling Brothers three touring circuses with their annual 1,000 shows to witness elephants doing completely unnatural acts on command under a colourful circus tent for decades. But these cruel acts will be a thing of the past starting in 2018 as announced by Feld Entertainment in the New York Times. It's about time, since it was 1870 when the circus started abusing elephants. For 35 of these years multiple animal rights groups protested this cruelty and provided the public with undercover footage of Ringling Brothers abusing baby elephants. As a mother, to see any baby in distress and being abused is horrible regardless of species. I, for one, have always refused to take my son, now nine, to the circus. Well, the animal circus that is, we have attended Cirque de Soleil, a people-only circus! I was relieved (okay, thrilled) to hear about Ringling Brothers making this change, of course eliminating all animal acts is even better. I proudly attended protests to raise awareness and educate other parents when the Shrine Circus came to Toronto dragging their sad elephants behind them. But we don't stop at the circus; my son and I don't go to the zoo either. I don't forbid him to attend, but he's old enough to know the facts and decided not to participate in animal exploitation. Many animals go crazy behind bars and it's common for them to display neurotic behavior they are so desperate for freedom. This is not how I envision my son learning about animals. And furthermore, I see nothing natural about a zoo. Animals that normally roam, fly, and swim at their leisure now sit on concrete slabs behind glass. How is that educational? And what about the wild captured animals that die in transit? Even the survivors have a shortened life span behind bars. When I started doing research I found that wild elephants can live over 70 years but in captivity many die before age 20. In Toronto the three aging captive Toronto Zoo elephants were finally saved from the freezing winters and released to the Performing Animal Welfare Society -- a California sanctuary in a warmer climate -- thanks to Bob Barker for paying the hefty moving bill! My son and I watched the CTV television footage of the elephants being transported and cheered when they arrived safely at their new home. That was a magnificent day for elephants! I know without a doubt zoos don't care about animals, if they did, they wouldn't hold them against their will or kill them. They are more concerned about making money than animal welfare. They don't "protect species from extinction" as they may lead you to believe. In my research I also found that animals are rarely, if ever, released back into the wild from any kind of preservation program they allegedly have. Most animals in zoos are actually not endangered at all! Zoos like animals that are "cute" and popular among tourists and children. But not my child. I hope that we will do our best to teach the children in our lives about compassion. It's never too late to choose kindness. Do you remember last year when Copenhagen Zoo officials killed a completely healthy baby giraffe named Marius in front of children and mercilessly fed it's body parts to their captive lions? It definitely wasn't a good day for giraffes. Despite people around the world begging for Marius' life to be spared through online petitions receiving tens of thousands of signatures, including mine, and wildlife parks around the world offering to adopt Marius, this sweet baby was still killed for no reason other than his life was meaningless to zoo officials. But let Marius be an example about the cruelty zoos inflict on animals. * What do you think children learn from a visit to the zoo? * Is it inspiring for children to see animals in captivity? * Is the zoo a happy place? * Are humane alternatives available? The Copenhagen Zoo is not unique as zoos around the world kill their animals for ridiculous and immoral reasons (It is not euthanasia if an animal is not suffering). I found that zoos are not usually public about their killings because it's bad for business. Since zoos unethically mate animals against their will they end up with too many babies. Not all of them are killed like Marius, many end up in a fate much worse. Some babies are sold into animal experimentation; others are sent to livestock auctions and killed or eaten; others are sold to circuses like Ringling Brothers where they spend a lifetime being tortured and abused for "entertainment." Just more reasons why my son and I choose other forms of entertainment! With Ringling Brothers decision to no longer use elephant acts they are sending a clear message -- animal abuse is no longer acceptable. We have the power to put the zoo out of business! All we need to do is not buy a ticket! Children deserve to learn about the wonders of the world through humane education so they can nurture their natural empathy and respect all living creatures. 1. Visit a farm sanctuary with rescued animals that allows visitors! 2. Read a book or magazine with photographs of animals in the wild. 3. Watch a wildlife documentary or television series about animals in their natural environment that was filmed humanely. 4. Go online! Check out The Elephant Sanctuary in Tennessee in real time via free live web cam. 5. Animal themed humane workshops are available and often go to schools. 6. Take a humane eco-vacation and see animals in their natural environment. 7. Visit a wildlife rehabilitation center such as the sanctuary in Chile, Parque Safari, that rescues abused and mistreated animals and restores their health. Best part? The humans are in the cages! Caged vehicles drive the visitors around the five-acre park while most of the animals are free to roam as they wish. 8. Check out your own backyard, a ravine, forest or park. It's more educational for kids to see squirrels running and climbing trees in their natural environment versus staring at an unhappy drugged out bear or lion sitting sadly in a concrete cage. Oh yeah, and remember those lions from the Copenhagen Zoo that devoured Marius the baby giraffe? Well, a few months later the same zoo killed the lions too. They were also perfectly healthy and wanted to live. It wasn't a good day for lions.